I first experienced symptoms of breathlessness and persistent coughing in 2005. I weighed 230 lbs. (42 BMI) so I lost 60 lbs and the symptoms went away. But I weighed 190 lbs (34.8 BMI) by the time I was diagnosed with PF in January 2011 — IPF via lung biopsy Sep/12. After being hospitalized in March 2013, I saw my PF specialist as I was still struggling, using a walker to get around and I was mad that being the hare, I had to let the tortoise win. Doctor put me on prednisone and referred me for transplant but I still needed to lose weight (30 BMI or less for assessment). Time to get serious! I followed my 2006 weight-loss program and with prednisone and oxygen therapy, I became more active again. I didn’t “formally” exercise, doing my normal activities, walking the farm property, and other physical activity indoors and outdoors. I used myfitnesspal.com to track my weight daily and my food intake. By becoming more conscious of my food choices I learned there are health-wise vs weight-wise choices, that is, not all vegetables are created equal. By transplant assessment in June I went from 33.6 BMI (183 lbs) to 30.1 BMI (165 lbs.) and had basically recovered my pre-exacerbation levels for PFTs and 6MWT. The assessment decision was suitable but too early. I turned my attention to doing everything I could to avoid a transplant — to maximize my time pre-transplant — managing my IPF as a chronic disease. By late summer I was 155 lbs. (28.5 BMI). In April 2016, I was again referred for transplant and to maintain my exercise tolerance, I went back to my local rehab program twice a week. The weight just slowly dropped off as my appetite decreased, the coughing increased, and the breathing became more work. Some weight loss may be due to exercise but I usually find that I needed to increase my calories to keep my energy up. By the time I was re-assessed for transplant I had dropped 20 lbs. simply due to the disease and the calories burned with the effort of breathing and the decreased appetite. I was listed November 8th, 2016 and was now exercising 3 times per week, all at Toronto General Hospital (TGH) for the first month, and then 2 times per week locally and once per week at TGH. By January I was down another 10 lbs. to my ideal weight range (22.5 BMI) and effort was turned to maintaining that weight which I did up until my transplant on June 20th. 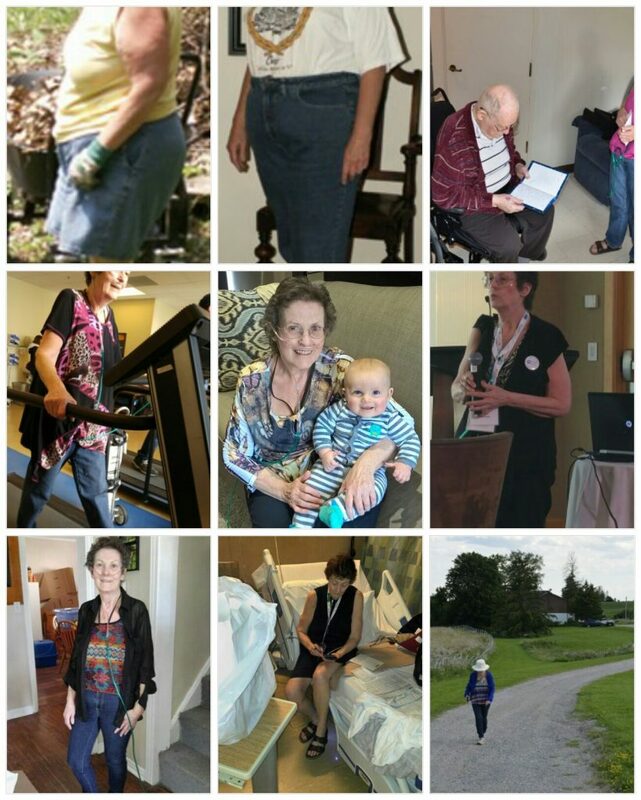 Because of my weight loss and my exercise regimen prior to transplant, although my lungs were getting worse I was still able to drive, shop (using the mobility cart), cook, look after my personal needs, and many other things. Since transplant, I’ve maintained my ideal weight and almost immediately returned to my pre-transplant exercise levels. Except for driving, I’m back to doing everything I did 3 years ago including walking the hilly farm property. The lesson I learned through this journey was that exercise is very important and the more I exercised, the more energy I had. And this also applied to weight-loss. However, you could never exercise enough daily to lose weight — you must modify what goes in and become mindful or educated about your choices. Tracking your activity and what you eat is essential. And don’t wait until transplant assessment time to get serious about weight loss and exercise. Do it early in your diagnosis. It takes time to lose the weight and you will benefit from the results.